LITMUS Benchmark Suite, is an open extensible framework for benchmarking a plethora of cross-domain DMSs. An efficient way for replicating existing benchmarks (e.g., BSBM, WAT-DIV). Present a custom visualization via custom charts, graphs and tabular data of the benchmark results for a faster insight. there is a lack of a common framework which enables and advocates the extensibility and reusability of the benchmarks. 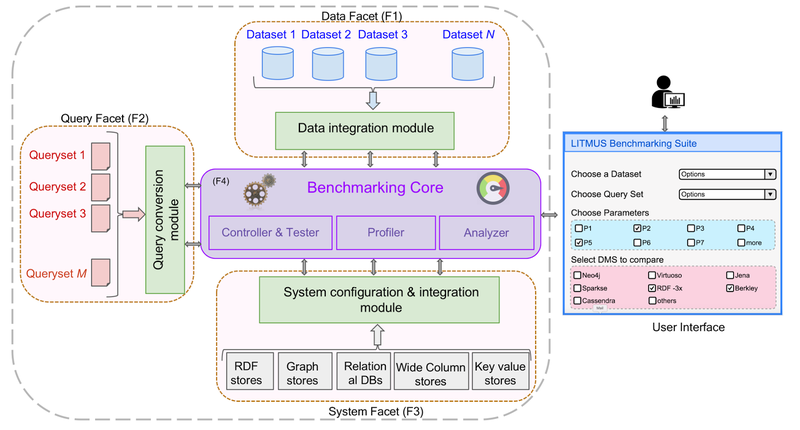 LITMUS will go beyond classical storage benchmarking frameworks by allowing for analysing the performance of DMSs across query languages. The focus of LITMUS is to bridge the gaps in adopting, deploying and scaling the consumption of Linked Data. LITMUS thrives on simplifying the use, assessment and the performance analysis of a wide spectrum of cross-domain DMSs. Enable a common platform for benchmarking and comparing a plethora of cross-domain DMSs, and reproducing existing third-party benchmarks. Create interoperable machine-readable evaluation reports and scientific studies on the correlation of a variety of factors (such as query typology, data structures used for indexing, etc.) with respect to the performance of DMSs. Recommends particular DMSs and benchmarks based on a set of requirements predefined by the user. Query language expressivity and supported features striving to address the language barrier [C2]. These studies will provide us with deep insights about the functionality of various query languages, RDF data formats, their strengths and limitations. A novel data converter of RDF data to multiple data formats (such as CSV, JSON, SQL, etc. ), providing compatible data as input to the cross-domain DMSs. A novel query translator for the automatic conversion of SPARQL to DMS-specific query language (e.g., Gremlinator, etc), enabling compatible query input for cross-domain DMSs. An open, extensible benchmarking platform, for cross-domain DMS performance evaluation and easy replication of existing benchmarks. Full-time researcher at Informatik III department of University of Bonn, Germany. 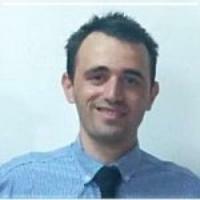 Gëzim Sejdiu is a PhD Student & Research Associate at the University of Bonn. 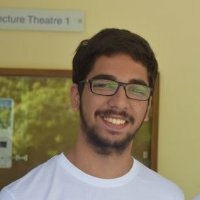 Gëzim’s research interest are in the area of Semantic Web, Big Data and Machine Learning. He is also interested in the area of distributed computing systems (Apache Spark, Apache Flink). Final year undergraduate student at DA-IICT, Gandhinagar.